The natural beauty of Hawk Hill Farm is its’ breathtaking views of the Berkshires, Mudge Pond, and Twin Oaks Field. So striking are these views that the highest six acres of the 40-acre property have been preserved forever by the local land trust. 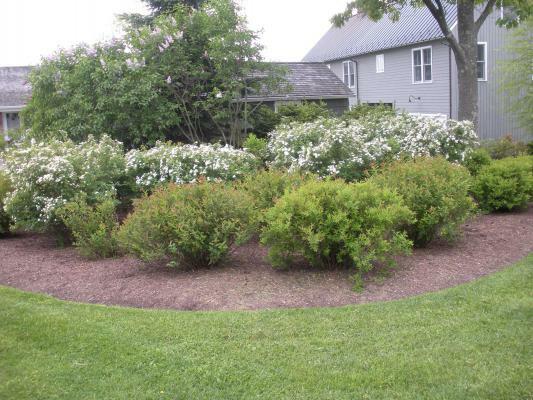 Views are just the beginning of what you’ll see at this lovely estate! The terraced gardens include a goldfish feature with water flowing from an antique Chinese watering trough. A high wall separates the pool from the enclosed cutting garden. In May, featured plants are Bergenia, Brunnera, Darmera peltata (umbrella plant), Dicentra (bleeding heart), Primula, Pulmonaria, and Rodgersia. Close by is a small orchard where two apple, two peach and two pear trees are under-planted with tulips. Beyond the backyard fence are the frog pond, the wildflower bed, and at the bottom of the hayfield a wet meadow garden that is “a work in progress.” Along the edge of the field are eight birdhouses, where you just might spy a bluebird! 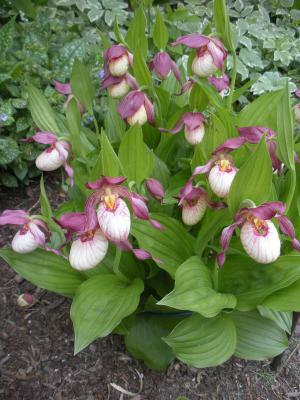 In May, most of the action is around the guest house where Jane has a special affection for her lady’s slipper garden that contains a dozen varieties of Cypripedium plus other early-blooming specimens, many of which were purchased over the years at Trade Secrets. 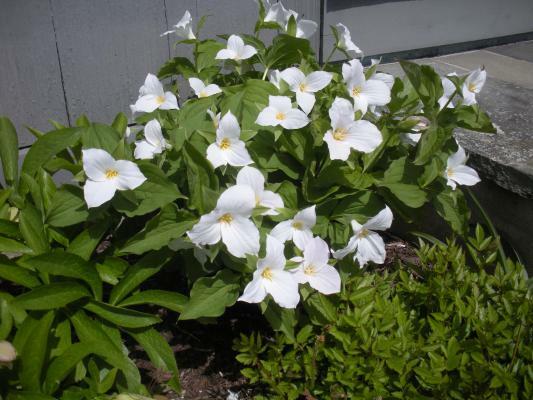 Some of the other plants at the guest house are Aquilegia, Epimedium, Helleborus, and Trillium plus collections of ferns, hostas, and Solomon seals.